Maybe I read the wrong newspapers, but around the time of the September earthquake in Christchurch, I got the impression that it came as a very big surprise to all concerned. I got the impression that people thought Christchurch was safe as houses as far as earthquakes went. Not quite the last place on earth for an earthquake, but low risk. Well. That was the impression I got from what I read, and from people I know who live there. How wrong I was. My last blog on this subject reported a few of my speculative thoughts on the matter, and quoted from the abstract to research by the NZ Institute of Geological and Nuclear Science (NZIGNS), published in Environmental and Engineering Geoscience 1995, and entitled Geology of Christchurch. It took a while to track down the actual report itself, but I found it buried within the Serials section of the General Library at Auckland University. There are 61 pages of it covering many aspects of the geology of Christchurch and a detailed section on the risk of earthquakes there. My reading of the data suggests that between 1869 and 1988 there have been 12 earthquakes bigger than 6.0 on the Richter Scale within 150 kms of Christchurch. Two of these were 7.0 and larger. 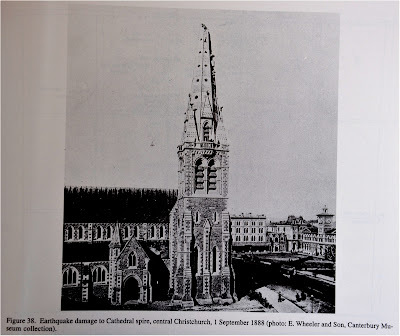 The report contains this photo of earthquake damage to the Cathedral spire from an earthquake in 1888, and reports that the Cathedral was also damaged by earthquake in 1922 (a magnitude 6.9 earthquake centered around Motunau) and in 1929 (the Murchison earthquake). 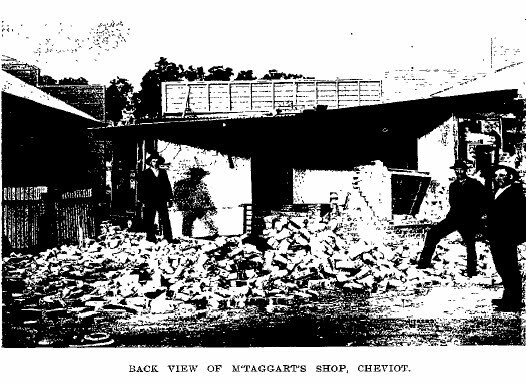 I discovered newspaper reports in the National Library that it was also damaged by the Cheviot earthquake in 1901. The NZIGNS report tabulates 59 earthquakes that were “felt in Christchurch” between 1946 and 1994 (9 of these were centered outside the central South Island). 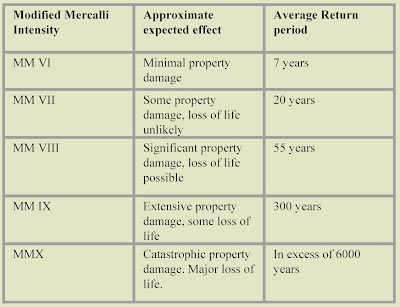 Interestingly, the report tabulates the intensity of these earthquakes within Christchurch in terms of the Modified Mercalli Scale and the Richter Scale. I. Very mild movement, only detectable by instruments. II. Some people feel a slight movement, particularly on upper floors of buildings. Suspended objects such as chandeliers may swing. III. People indoors feel some movement, similar to passing traffic. IV. Motion is felt by most people indoors and some outdoors. Windowpanes and kitchen utensils rattle; parked vehicles rock. The movement is great enough to wake sleepers. V. Felt by all people. Tall objects rock; plaster cracks and falls. VI. Alarmed, people run outside. Poorly constructed buildings begin to show damage. Motion is felt by people in moving vehicles. VII. Only slight damage in well-constructed buildings; slight to moderate in well-built ordinary structures; much damage in poorly constructed buildings; chimneys broken. VIII. Damage is still only slight in structures built to be earthquake-resistant; among substantial ordinary buildings there is much damage and some collapse. Poorly built buildings are substantially damaged. Tall things such as chimneys and monuments collapse. Heavy furniture is overturned. IX. Even in earthquake-resistant structures, there is considerable damage. Greater damage in substantial ordinary structures; more collapse. The frames structures of buildings are thrown out of plumb, and buildings are shifted off their foundations. X. 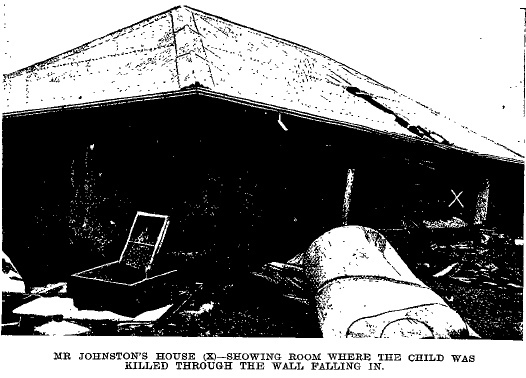 Some well-built wooden structures destroyed; most masonry structures demolished with foundations. Rails bent. XI. Few if any structures remain standing. Bridges destroyed, rails greatly bent. XII. Total damage. Lines of sight and level are distorted. Objects thrown into the air. 5 June 1869: Earthquake in early ChristchurchOn 5 June 1869, Christchurch settlers were shaken by an earthquake centred beneath the city, possibly around Addington or Spreydon. The earthquake was probably shallow, with a magnitude of about 5.8. There was damage to stone buildings and the spire of St John’s Church on Latimer Square, and many fallen chimneys. The quake may have caused some ground settlement in the Heathcote Estuary, as locals describe the tide as running higher up the Heathcote River afterward. On 31 August 1870 the Canterbury region was shaken by an earthquake with an estimated magnitude of 5.8, centred south of Banks Peninsula, near Lake Ellesmere. Damage was minor in Christchurch—a few fallen chimneys and some structural damage to buildings. Shaking at Lyttelton and Akaroa was much stronger, with rocks falling from cliffs around Lyttelton harbour. Here is a section of the “red zone” map released by Government this week which includes Bexley, Avonside and Dallington. 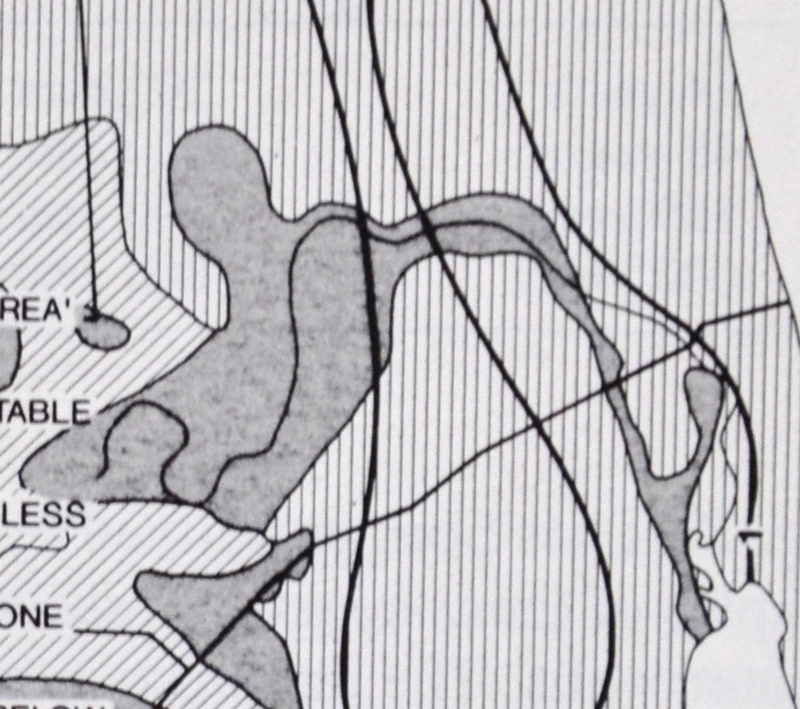 Note the similarity with this image which is a section of the NZIGNS map encompassing the eastern suburbs. The NZIGNS report tabulates predictions for the likely return periods of different magnitude earthquakes that might affect Christchurch in future. These are under a section headed: “Seismic Risk”, which notes work done by “Elder and others”, and which is tabulated as the graphic to the left shows. Among other things it predicts that quakes as damaging as Christchurch has had recently (at least MMVIII) will happen every 55 years on average. “…the authors leave nothing to the imagination in the question of local and regional seismicity… clearly, there is now a case for elected officials to take note and to ask and allow local and national agency geologists and engineers, planners and consultants alike, to assist in providing enforceable seismic-withstand guidelines or regulations. Looks like it took another 16 years before anyone woke up actually. (You can see this summary here). These probabilities indicate that Christchurch has an overall seismic hazard level comparable to Wellington for medium intensity earthquake shaking… The greatest concern for Christchurch, located near a saturated, sand and silt rich, prograding coastline, is the potential for liquefaction…. This may cause subsidence, foundation failure and damage to services. Analysis shows that large areas of the city are underlain by sands or silts which, if sufficiently loose, would be highly susceptible to liquefaction…. Analysis indicates that potential exists for relatively rare but very large earthquakes (approximately magnitude 8) along the Alpine fault, which essentially marks the western edge of the Southern Alps. More frequent moderate to large earthquakes (around magnitude 6-7.5) can be expected in the Canterbury Plains foothills and North Canterbury area, and less frequent moderate earthquakes under the Canterbury Plains and Christchurch itself. The attenuation model predicts that the damage in the city from these three types of event are likely to be similar. Of the four serious earthquakes in the early city history, three occurred in the foothills and North Canterbury region (the Amuri, Cheviot and Motunau earthquakes) and one virtually beneath the city (the New Brighton earthquake). We have not attempted an in-depth lifelines study for Christchurch, or included economic or sociological analysis in this report. In addition to the need for this type of work, we recommend further action from the engineering profession including a review of the current seismic loadings code, local seismic design practices and building stock. We suggest site specific studies for the Lyttelton tank farm, Bromley sewerage ponds, pumping stations, substations, hospitals, civil defence facilities, airport and key bridges. Major areas of further research include studies of sand density variations and susceptibility to liquefaction across the city; continued paleoseismic evaluation of adjacent active faults, particularly the Alpine Fault, and further investigation of the deep sediments below the city. 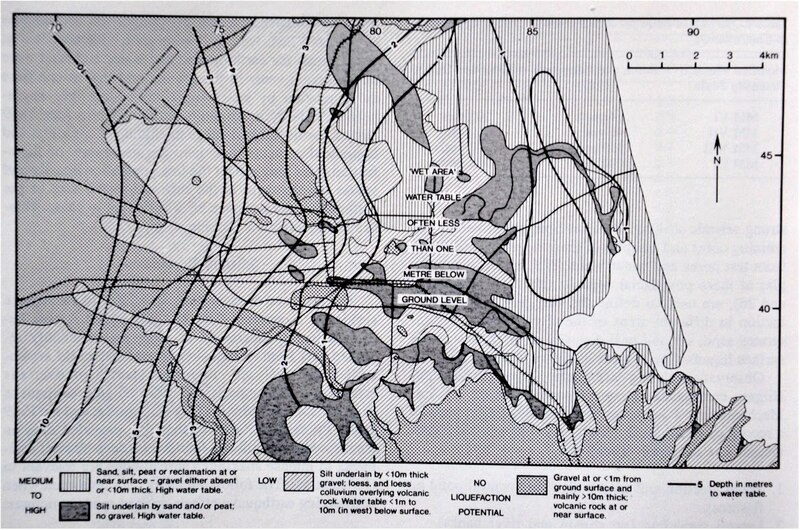 The EQC Seismic Risk Assessment for Christchurch is dated 1991. Twenty years ago. How much of this work was ever done? How much of this advice was accepted and acted upon? There are many questions that need to be answered by those in authority. Why? I'll suggest why. This information cites four earthquakes that did severe damage in and very close to the City of Christchurch (1869, 1901, 1922 and 1987). 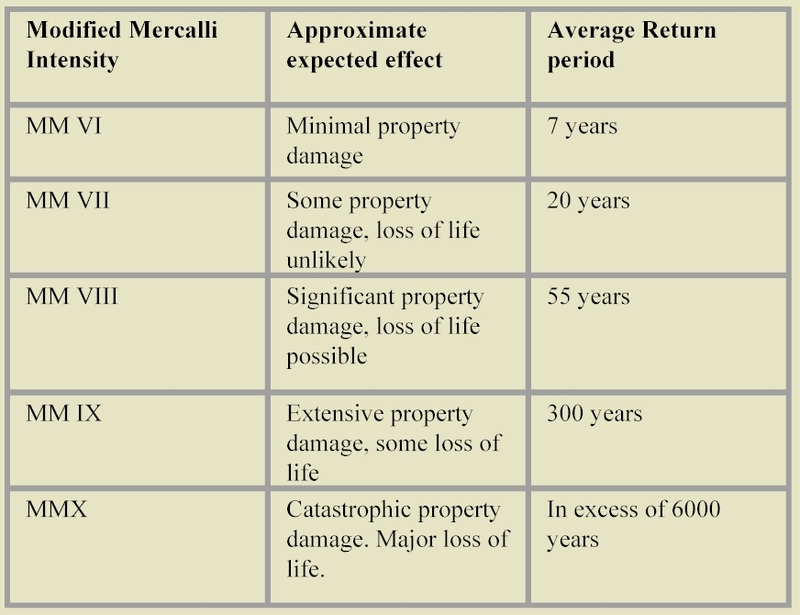 Based on this information the EQC report predicted a return period for another equally devastating earthquake of 55 years. Given the Cheviot earthquake in 1901, and then the Christchurch February 2011earthquake - exactly 110 years later - with a couple of big ones in between, perhaps their predictions are conservative. New Zealand was advised this earthquake sequence was likely. So whose fault is it that authorities didn't act? Hello, my name's Joe Bloggg and I'm standing in your area as a Councilor/MP. I've seen a report that shows Christchurch is under considerable risk of building collapse/liquefaction should there be a major earthquake in the future. If elected I will work hard to ensure that the necessary work is undertaken to minimise these risks. Of course, we will need to raise your rates by 15-20% to cover the cost of this work, but I'm sure you will agree with me that this is minor compared the serious consequences that might occur due to an earthquake that may or may not occur sometime in the next 50 years. Am I likely to get your vote? This is just one example of a more general observation I have made many times in the last decades: The people are not responsible enough to live in a democracy. It's always "who will give me the most of what I want", not "who will be best for the country/planet". I partly agree with you, but Council doesn't need to put the rates up to get more earthquake proof buildings constructed. It does need to adopt regulations however, which buildings have to comply with, to get earthquake accreditation (for example). Then when the insurers come along, they ask to see that accreditation, and then charge an appropriate premium - reflecting the risk. That would be the market in operation - and an appropriately regulated development regime. And that's the reason why we should be using Modified Mercalli - because it's all about "building to the conditions" - the local conditions. Christchurch has clearly been prone to small earthquakes all it's life. But little earthquakes, nearby, are very damaging to inappropriately built constructions. The Cathedral has lost part or all of its spire 4 times (I think) due to earthquakes since being built. Apparently there was pride at it being the tallest structure in the world - given how earthquake prone the land it stands on has always been. Very kiwi. The Cathedral has been telling us something for more than a century. Don't build these kinds of structures on shakey sand. The real estate industry has been doing so well that no one listens to doomsayers. Did you know: In Canterbury Regional Council v Banks Peninsula District Council (CoA CA99/95), the Court of Appeal held that this function (RMA Natural hazards subsection 30(1)(c)(iv)) requires regional councils to avoid or mitigate the effect of a natural hazard, not to control its occurrence (as if...). How has Canterbury Regional Council acted to mitigate the effects of earthquakes - given it must have been advised more were predicted? You comment that Real Estate is going so well... but hold on.... they just sell houses... isnt it the DEVELOPERS and the CITY COUNCIL that approved these sites!! I mean common.. BELXEY is built on a dump for goodness sake!!!! About 8 years ago, we bought a house in Christchurch. It was just down the road from Merrivale (in Papanui, 40 Bennett St). We sold it about 5 years ago, because my son’s educational aspirations changed and he moved back to Auckland. Anyway, before purchase, I inspected on my screen the (then current) planning maps for the area. 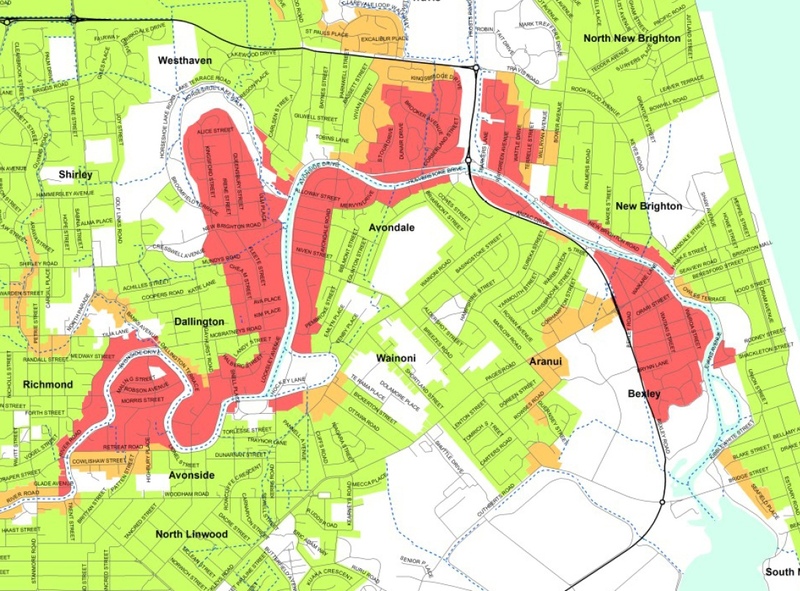 Running through the middle of the suburb and also through Fendleton, St Albans etc, was a very clearly identified zone (swathe) entitled the Christchurch Liquefaction Zone. I have just tried to look at the planning maps again on the ChCh City web site, but can’t seem to bring up any such zone on the current plan. Either I am incompetent, or the zone has been removed at some stage as part of a Plan Change process. I have not imagined the matter. It was there on the maps! 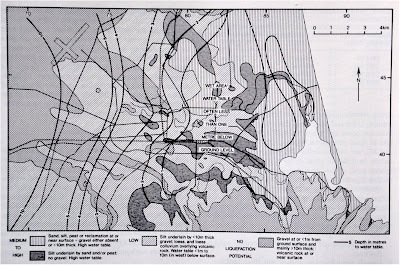 So with respect to your reflections on prior hazard reports, at some stage the planners were, in fact perfectly well aware of the extent of the liquefaction zone described in the reports you cite. Either I am incompetent on my computer, or, worse still, somebody had the bright idea of substituting the weasel words I now find in the Plan statements under “hazards”. At the time I understood perfectly the significance of the zone, but on balance decided to buy the house in any event. But others probably did not understand the significance at all. 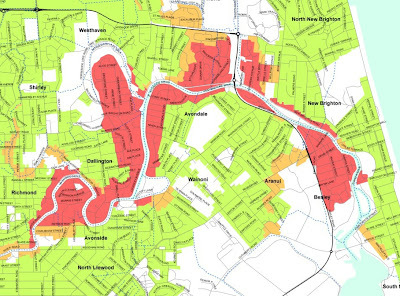 What happened to the coloured Christchurch Liquefaction Zone on the planning maps? If it was subsequently removed in a Plan Change, whose bright idea was that and when did that occur? I am happy for you to post this comment. You ask whether any of this was done: "We suggest site specific studies for the Lyttelton tank farm, Bromley sewerage ponds, pumping stations, substations, hospitals, civil defence facilities, airport and key bridges." I grew up in Chch and I too was surprised that people didnt expect an earthquake in Chch. When I was growing up in the 1980s I was always told it was when not if. Also, having advised many people on property purchases in Chch as a lawyer, the LIM reports all quite clearly stated that the liquefaction zone existed. I always pointed this out to people and I guarantee the people like Dr Bellamy had this disclosed to them by their lawyer when the purchased the property. So the risk was there for all to see. However, my clients were always very dismissive as anyone would be. If you wanted to avoid that risk then you were limiting yourself to a very small pool of houses and in not very desirable areas. The fact is Chch was originally marshland and not very good land for a city. We dodged a bullet for 100 years but eventually the worst happened. I realise the desire of people to look for scapegoats but this was the defintion of an act of God. How do we prepare for that now? If a pool of lava appears under your house tomorrow in Auckland, whose fault is that? You know the city is built on 7 volcanoes.